The World's largest and fastest growing Free Zone reported recordbreaking growth in 2016, and 33% annual growth over last decade. Dubai and DMCC’s mandated goal of connecting new markets with well-established markets is clear, and in 2016 we achieved it by welcoming an average of 7 new companies every working day. This brings significant foreign direct investment to Dubai. 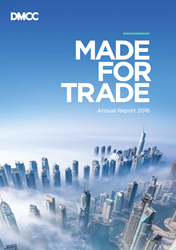 DMCC, the Government authority on trade, enterprise and commodities in Dubai, today released its annual report with strong results including a record-breaking 2,016 new member companies in 2016, an increase of 14 percent on the previous year, and an average annual growth rate of 33 percent over the last decade. DMCC is now home to 13,500 companies, making it the largest Free Zone in the world. The figures, released today in DMCC’s 2016 annual report, cap an outstanding year for DMCC’s commodities, property and Free Zone portfolio, culminating in being named the world’s leading Free Zone for a second consecutive year by the Financial Times’ fDi magazine. Other key achievements included record-breaking trading volumes of over 19.7m contracts worth $440bn on the Dubai Gold and Commodities Exchange (DGCX), an increase of 36 percent on 2015; DMCC Tradeflow recording 11,412 murabaha transactions with a total value of AED 58bn, a value increase of 405 percent compared to 2015; and the appointment of DMCC Executive Chairman Ahmed Bin Sulayem as global Kimberley Process Chair on behalf of the United Arab Emirates, a major honour and recognition of Dubai’s and UAE’s leadership status within the global diamond industry. “Dubai’s advantage of being located at the natural crossroads of the world’s major markets, both in terms of time zone and proximity, means we remain optimally positioned to facilitate global trade. But it is also the unrivalled quality of the infrastructure, the professional support and physical platforms for trade we offer that brings international business to DMCC. The Dubai Gold and Commodities Exchange (DGCX) historic launch of DGCX Shanghai Gold Futures (DSGC), following the signing of a landmark deal with the Shanghai Gold Exchange (SGE) last year. The yuan-denominated contract, DSGC, marks the first-ever usage of the Shanghai Gold Benchmark Price in international markets. DMCC Tradeflow bringing its Shariah-compliant Salam forward financing transaction to market, enabling a purchaser to pay in advance for buying specified assets which the seller will supply on a pre-agreed date. Announcing plans to develop a coffee centre. The DMCC Coffee Centre which is to offer storage and warehousing facilities, offices and co-location space within a 4,500 square meter temperature controlled facility. The DMCC Tea Centre handled 41.6 Million Kilos of tea in 2015 with a growth rate of 200+ percent over the past three years. It currently processes teas from 13 different countries including Kenya, India, Sri Lanka, Indonesia, Malawi, Rwanda, Tanzania, Mozambique, Vietnam, Japan, Uganda, and China. 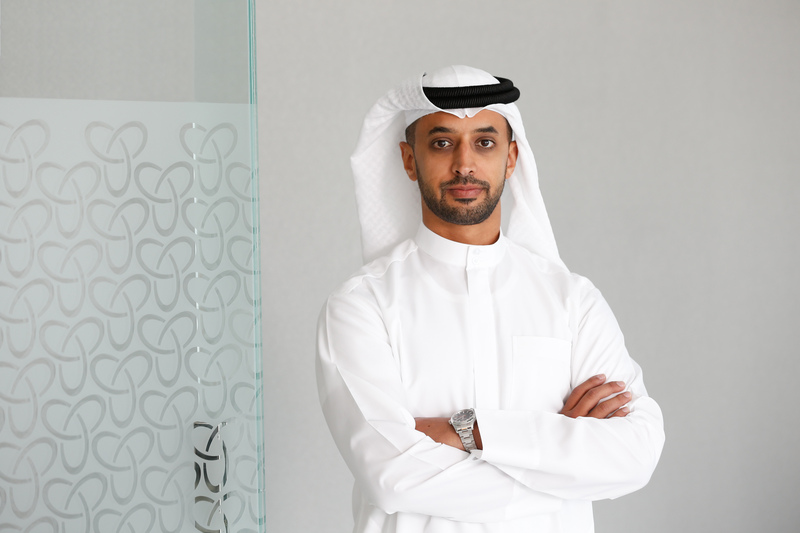 DMCC also announced it will launch its own tea brand, Shai Dubai, a signature, high-quality tea crafted in Dubai. The launch of the Food Trade Group, the first initiative in Dubai developed to bring banks and the food industry together. Dubai is also the leading physical gold market and in the top three diamond trading hubs in the world. Further underpinning DMCC’s drive to connect markets and boosting commodities trade along the West to East corridor – connecting directly into China’s Belt and Road initiative, DMCC launched its international road show in China in October as part of Dubai Week in China. This year, DMCC’s international outreach programme launched in the UK in March, ‘Made for Trade Live’, will also see DMCC visit China’s Shanghai and Shenzhen in April. DMCC also signed over 20 MoUs in 2016 with a strong focus on China and hosted 155 local and international events, including the Kimberley Process Intercessional and Plenary. As for its property division, the DMCC community today comprises 66 commercial and residential towers with a community and property portfolio maintained to the highest standards to ensure over 87,500 people can live, work and thrive in Jumeirah Lakes Towers. Burj2020 District: DMCC completed its Burj2020 District master development plans, which will see DMCC bring a new premium mixed-use district to Dubai tailor-made for the global business community. The Burj2020 District, will offer world-class commercial, residential and retail spaces, including premium hotels, restaurants, recreational areas, and two iconic super-tall towers designed by leading architects Adrian Gill & Gordon Smith. One JLT: DMCC is also creating unique grade A commercial spaces. One JLT which we delivered end of 2015, is a good example of this with sustainability at the core of Dubai’s ongoing developments, One JLT is a LEED Gold Standard commercial building, which provides energy-efficient commercial space over 14 floors. Today you will find Modul University, One Business Centre, Tim Hortons, Omobono, Real Pilates, 1762 and more in One JLT. Smart District: In 2016, DMCC focussed on creating a long-term Smart District strategy to ensure the entire Free Zone community of around 87,500 people (residents and employees) can live, work and thrive in a cutting-edge community that offers the latest available in technology, connectivity and amenities through smart objectives and initiatives that are aligned with Dubai’s smart city guidelines for the benefit of our entire community. Initiatives are being rolled out this year. DMCC’s Free Zone, the largest and fastest growing in the world welcomed 2,016 new companies in 2016 – an average of seven new companies each working day. Despite a slowing economy globally, DMCC reported strong growth, with over 13,500 companies in the Free Zone today including Alcatel Lucent Middle East and North Africa, American Express, Bulgari, Carrera Y Carrera, Colgate-Palmolive, Duracell, Dyson, Eurofin, Hakan Agro, John West Foods, Louis Dreyfus, Lukoil, LVMH, Nutricia Danone, Oddfjell, Olam International, Tata International, TAG Worldwide, Topaz Energy and Marine, and Whirlpool. 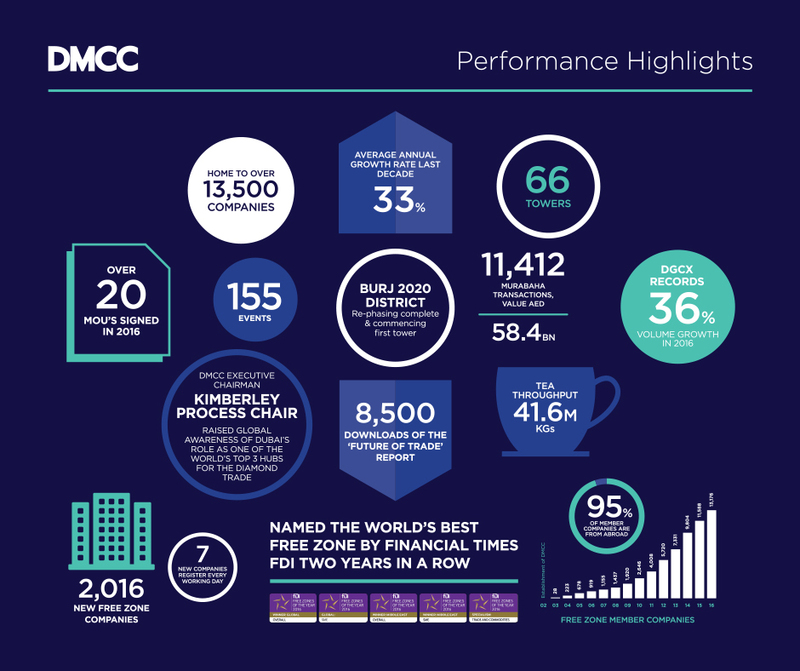 “In 2016, DMCC delivered strong performance by attracting a record 2,016 new members to our Free Zone; delivering high quality commercial spaces such as ONE JLT; enhancing products, services and infrastructure for our customers; and by creating new, as well as nourishing more established marketplaces for the benefit of global trade. “We created unique offerings for the agricultural industry, commenced our coffee centre, and fostered greater collaboration across a range of commodity sectors. This will see DMCC bring more industry players and market opportunities to Dubai. “In 2017 we will continue to expand our international reach, form new strategic partnerships; and further enhance collaboration with key industry, trade and government entities locally and internationally, as we continue our journey as the world’s leading Free Zone”, concluded DMCC’s Chief Executive Officer, Gautam Sashittal. As an authority of global trade, DMCC also launched its thought leadership programme with a report on The Future of Trade. The report generated over 8,500 downloads and puts Dubai in a strong position as a world authority on global trade and, provides a view of how ‘The Future of Trade’ will unfold over the next ten years, building on insights shared by 150 experts across five continents over twelve months. ‘The Future of Trade’ report was produced by DMCC in conjunction with Futureagenda.org and the Centre for Economics and Business Research (Cebr), a leading UK economics consultancy. For further information on DMCC and the full annual report visit: https://www.dmcc.ae/news/2016-annual-report. DMCC is the authority on trade, enterprise and commodities in Dubai—home to the world’s leading businesses of today, and tomorrow. DMCC is developing the ‘Burj2020 District’ as part of our DMCC Free Zone expansion strategy to provide leading businesses with a commercial property offering unique to the Dubai marketplace. Indispensable to the economic growth of the nation, we - together with our members - deliver strong performance today, and sustainable growth tomorrow.